Web 2.0 I sort of get it now. So last Friday I almost had a horrible day. It got off to a horrible start. On the way into work my favorite radio station, 95.3 The Range, was not coming in. 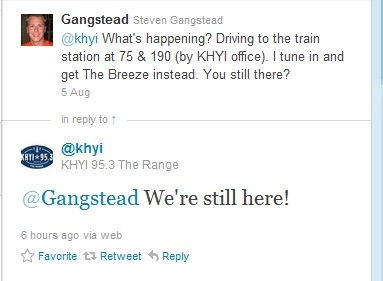 I only drive ten minutes to the DART station and as far as I’m concerned KHYI is the only station I ever need. If they play a song I don’t care for (rare) I just turn down the volume for a few minutes instead of search around for anything else. Not only was it not coming in, but a different station was coming in loud and clear and was even announcing its channel so I knew I was tuned in correctly. I figured that the station had undergone a format change, I don’t think they usually announce beforehand when that happens. I was very morose at work and I used my new twitter thingy on my cellular phone to post my sadness for all of the world to see. I even shot one at KHYI. Now it sort of clicks how Web 2.0 is good business. Without twitter I wouldn’t have had that casual connection with the brand I love. I suppose they check their facebook page as well, but I think the big difference there is that on facebook you control your brand. Your facebook page is a garden where only your prettiest users comments are allowed to stay up. Its also a creepy invasion of privacy (for which I get less return than Google’s invasion of privacy that I embrace). I think that’s one of the beautiful things about twitter. I’m sure I’ll figure out more years after everyone else has. Anyone can post about their experience with your brand so there’s a lot more motivation for the owner to monitor and defend their presence. I have no idea why The Range was down, maybe Brett Dillon spilled his breakfast beer on the antenna. I knew it was back up long before I got the holla back via twitter. Even still, I have a warm fuzzy in my heart that my favorite radio station reached out to me and that’s good business.